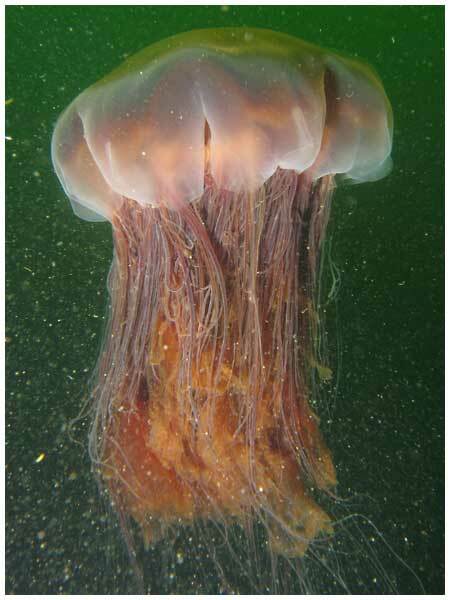 Capable of a bell diameter of over 2 metres (6 ft 7 in), these jellyfish can vary greatly in size; those found in lower latitudes are much smaller than their far northern counterparts with bell about 50 centimetres (20 in) in diameter. The tentacles of larger specimens may trail as long as 30 m (100 ft) or more. These extremely sticky tentacles are grouped into eight clusters, each cluster containing over 100 tentacles, arranged in a series of rows.